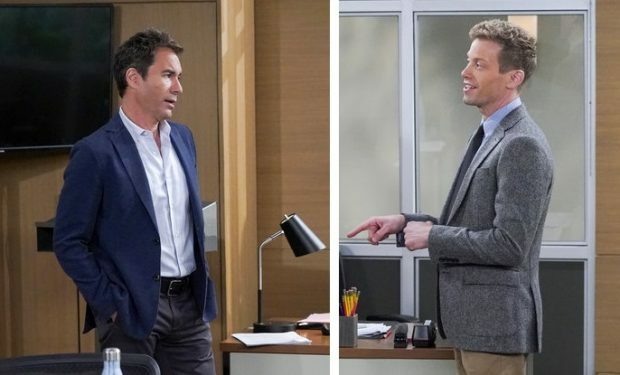 In the Will & Grace episode “The Pursuit of Happiness,” Grace (Debra Messing) helps Malcolm (Alec Baldwin) win back Karen’s (Megan Mullally) affections while Will’s (Eric McCormack) flirtation with his co-worker, Paul (Barrett Foa), takes a turn and puts Will in an ethical dilemma. Meanwhile, Jack (Sean Hayes) runs into Zusanna, the sister of his former acting teacher, who gets him all riled up about acting again. Just Jack is back! Zusanna is portrayed by stand-up comedian Andrea Martin. The two-time Emmy Award winner is known for her roles on The Good Fight (Francesca Lovatelli), Great News (mom Carol Wendelson), Difficult People (Marilyn Kessler), the 2016 TV movie Hairspray Live! (Prudy Pingleton), the My Big Fat Greek Wedding movies as Aunt Voula, and as various characters on SCTV with the late John Candy, Eugene Levy and Rick Moranis, among others. Will & Grace airs Thursdays at 9:30 pm on NBC, right after Brooklyn Nine-Nine and right before Law & Order: Special Victims Unit.